If you have even a scrap of marble in your home, consider yourself fortunate to be in the presence of one the most beautiful stones around. Marble is a limestone that has metamorphosed through heat and pressure, and in the process mixed with natural elements to produce the colors and intricate veining that has so many people pining away for it. And who could blame them? If only you didn’t have to keep it clean . . . . There are two very important things to know when wondering how to clean marble. The first is this: marble is not granite. People often confuse the two, or lump them together, but there are some major differences between marble and granite – mainly, that marble is much softer than granite, so it stains and wears more easily and cannot be treated in the same ways. The second thing to remember is that you must never use vinegar to clean marble. We often recommend vinegar on our site because it is a natural cleaning product that doesn’t harm you or (most of the time) what you’re cleaning. In this case, however, the acidic quality of vinegar (as well as many other cleaning products, like bathroom cleaners or those with lemon) will etch – dull – the surface of your marble. How to clean marble safely? Take a minimalist approach and go stronger only if you need to. For everyday marble cleaning, keep it simple. For quick touch-ups, less is definitely more. 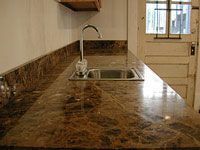 Use a soft cloth (I recommend a microfiber one) and warm, distilled water to clean marble countertops – especially after contact with food – and then use another cloth to dry the surface. Marble is very prone to water spots, so it is a good idea to never let it air dry. For cleaning marble floors, dust-mopping with a microfiber mop or soft cloth should be sufficient on a day-to-day basis, or plain hot water if you need to get rid of any marks. Again, remember to avoid vinegar and other acidic cleaners when cleaning marble, even if you really, really love the smell of Pine Sol. When your in-laws are visiting, get out the big(ger) guns for that marble. You’re going to need more than warm water this time. That’s not to say you should go overboard; it is still important to remember that marble is delicate. 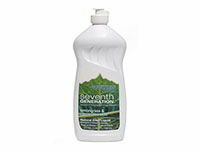 A ph-neutral dishsoap is probably best when you do your deeper marble cleaning, but you may also use acetone (for dark marble only, to be safe), hydrogen peroxide (for light marble), or clear ammonia mixed with water. You can purchase a non-abrasive marble cleaner, of course, but shop cautiously. If you’re nervous about damage to the stone, visit a store that sells marble and they’ll be able to help you out. Whichever product you choose, be sure to rinse thoroughly so there’s no residue left, always dry completely, and make sure you don’t slip on your slick marble floor! Clean marble stains as soon as possible. Just like acidic cleaners, acidic “stuff” in general is bad for your marble. 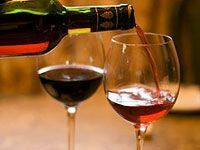 This includes wine, orange juice, tomatoes and even soft drinks, so get any spills up right away by blotting them – wiping or rubbing can make the problem worse. If you’re left with a stain anyway, use a commercial marble stain remover (remember to choose wisely) or make your own. Try making a poultice (a “soft, moist mass” – not just a medical term) out of a fine powder like whiting or baking soda, going for a peanut butter-like consistency. For oil-based stains (cosmetics, grease), use the powder with some water or rubbing alcohol. For water-based ones (coffee, tea), mix the powder with either hydrogen peroxide or acetone. When you have your poultice, wet the stain and apply the mixture. Tape plastic wrap over it and let dry (usually at least 24 hours); the drying process should lift the stain out. 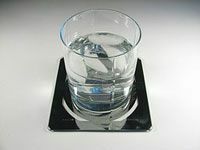 Protect your marble to save yourself a lot of trouble.Use those coasters you got from Aunt Hilda, even if they’re ugly. Be careful not to place anything hot on your marble countertops, and use ceramic or stone containers instead of metal to avoid rust stains. If you have marble in your bathroom, put felt under a tray for your cosmetics, perfumes, hairspray, aftershave, etc. For marble flooring, place rugs in high-traffic areas and remove your shoes at the door, and use pads under your furniture. Oh, and save the standing, sitting and dancing around like a maniac for your marble floors – not your countertops. Make your marble shine. Wondering how to polish marble? Well, you have a lot of options. The safest and easiest way to polish marble is with a chamois (shammy) on a damp surface; the chamois will polish at the same time as it dries. 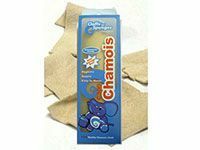 If you want more shine, try a commercial polish and then dry with the chamois. You can also use baking soda and a stick of chalk to polish marble. First wipe your marble with a baking soda mixture (3 Tbsp. soda to 1 qt. water) and let it air-dry (this time it’s okay) for a few hours before rinsing it. Next, moisten a fresh cloth and dip it in crushed chalk, wipe your marble, then rinse and dry thoroughly. If you’d rather not crush chalk or launder a bunch of chamois, use a commercial floor polisher or consult a professional. Consider adding a marble sealer and your marble may live longer. Not all stone necessarily requires a sealer, especially since often it is sealed when it is made and/or installed. 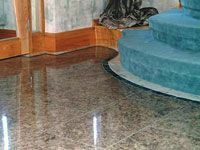 Because marble is quite porous, however (and because sealer loses its effect over time), it is wise to use a sealer to protect against staining and interior damage. A sealer isn’t foolproof, but it resists moisture for a lot longer than a surface that is not sealed; this matters when it comes to spills or mud on the floor – it buys you time, at least. Before applying a marble sealer, try to find out if and when sealer was applied and what brand was used. Some sealers need to be re-applied every year or two, others every fifteen to twenty years. If you do apply a marble sealer, be sure to use one that is nontoxic and – if you’re using it on countertops – safe for food preparation. What About Scratches on Marble? Now that you know how to clean marble, you may be wondering how to deal with scratches. If the scratch is slight, you can try fixing it yourself by using a course-grit sandpaper (starting at a 120 and working up to a 320) or 0000 steel wool. If the scratch is deep, however, or if you’re uneasy about doing it yourself and possibly damaging your marble (I would be uneasy), consult a professional. What About Wax on Marble? Some people use wax on marble because it can polish as well as protect, but it can also lead to discoloration – especially if your marble is white. For best results, try other methods first. What About the “Other” Marbles? Although marble commonly takes the form of countertops and flooring, it can be found in a lot of other places like showers, tubs, headstones, decorative objects, fireplaces, fountains and benches. And the list goes on. Basically, you already know how to clean marble: follow the same guidelines for this stuff as you would for your marble countertops and marble flooring, keeping in mind that it’s best to clean marble with a mild approach first. Method: The Daily Granite.This product is great because it’s easy to find – Target is sure to have it – and it’s green (well, it actually looks kind of blackish, but you know what I mean.) It’s got what you’re looking for if you want to be environmentally friendly: it’s biodegradable, nontoxic, and absolutely not tested on animals. And don’t let its name fool you: it’s okay to use on marble, too. You can order bottles of Method Granite Cleaner from Amazon. 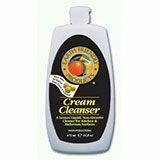 Earth Friendly Products Cream Cleanser. The cool thing about this product is that it won the Natural Home Magazine’s Readers’ Choice Award in 2002. It seems to have won a couple of other awards, too. This cleanser is made from sustainable ingredients, is biodegradable, nontoxic, untested on animals, and it won’t etch or harm surfaces – even marble. If you have a marble tub or shower, this stuff will clean it as well as eliminate mold. Not bad!